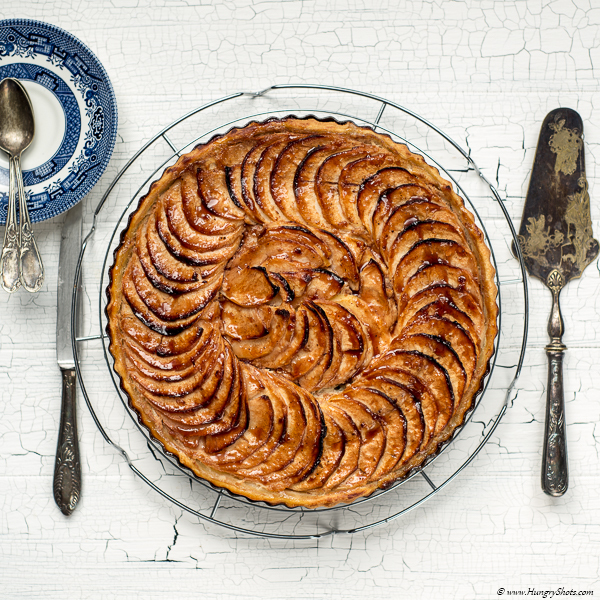 It is autumn, so by default it is time for an apple tart. This is a variation of an old recipe of mine called Alsatian apple tart. It couldn't be less tasty and delicious than the previous one. What I like about this tart is that is extremely quick for a great result. I made this cake for a visit we pay to some friends of mine. It was served with whipped cream and vanilla ice cream. Mmmm mniam mniam. Should I mention that it was gone in one shot? Stretch the shortcrust pastry on the bottom of the tart pan. Arrange the slices of apples in a nicely way. You can put one row and another one on top depending on how large your tart pan is. In a bowl, beat the eggs, add the sour cream, sugar and vanilla extract and mix well. Pour this composition in the tart pan over the apples. Brush the apples with jam. If the jam is not very liquid, and some water in it and mix. Brush it over the apples. This will avoid the apples to become dark in the oven and will give a shiny colour to the tart. Bake in the preheated oven for about 1 hour at 200ºC.